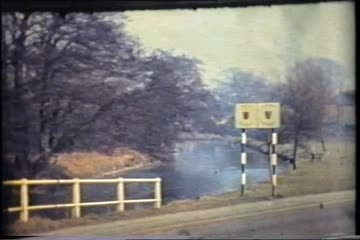 Summary: Film taken c1968-1973 of Uxbridge redevelopment and new film of 1991. Being part of an old Uxbridge family there is something rather sad in watching this film as it reminds me of the Uxbridge before the developers got hold of it and knocked all the character out of the town ( they did more damage than the Luftwaffe during the second world war ). There were medieval buildings destroyed such as those in Cross Street, beautiful old pubs like The Eight Bells demolished, such a shame. All in the name of "Progress" and now replaced with monolithic characterless glass,steel and concrete edifices which would not look out of place in New York or Chicago. The Uxbridge I grew up in during the 50's and 60's with the old cobbled yards with their gas lights, Fassnidge gardens running down to the River Frays, small local shops such as Constables the Bakers, Nicholls the butchers and Peddle ironmongers and everybody knowing everybody else , gone forever. As I reflect on all this I wonder if that development took place today then there would have been preservation orders placed on many of the buildings so ruthlessly , and shamefully sacrificed on the altar of change. I was brought up in Uxbridge in the 50's and have fond memories of it. It is now an eyesore and if I never go back there I won't be sorry. Uxbridge was a lovely little town before the developers got hold of it. I worked at King & Hutchings in Cricketfield Road (behind Randalls) in 1969 and would stroll around the cricket field at lunch time. I would use the Eight Bells pub and remember the landlord. Sad to see the destruction to create a monstrosity of a civic centre. Incredible video. I was born in 1993, Uxbridge born and raised. My memory is hazy of the time before the Chimes came in. It's nice to see how my hometown looked like before i had memories of it. So much of it looks identical today. I have some great memories from this place. Does anyone here have any further insight that grew up during the 70s, 80s or 90s in Uxbridge? What has changed upon returning? Favourite thing about this place? I personally loved the town centre late on a Sunday night (1am), so peaceful and quiet where you can just breathe in the history. 1960's architects and developers did more damage to our towns than the German Luftwaffe did during the war and Uxbridge is a case in point. What a lovely town it was prior to the redevelopment which knocked the stuffing and all character out of it in the name of "progress" some of those buildings were of Tudor origin and it was a crime that old buildings such as those in Cross Street were obliterated. I was a schoolboy attending The Greenway School at the time and even then was appalled at the destruction of so many fine streets,pubs and buildings ( The Eight Bells at St Andrews). It led on to Uxbridge becoming just another soulless town , a bland concrete jungle. As Cher would sing "if I could turn back time". I am trying to find photographs of the Pavilions Shopping Centre or the Peacock Pub which used to be where the shopping centre now is... any leads much appreciated. Maxwells - they may even have been the same premises. I loved the film but I am heart broken. Our shop (Wards') in Cross Street gone my old church Provident gone. Crown Wallpapers where I worked, Burtons' where I spent many happy Saturdays. It is very sad that more of the Heritage was not saved. Loved this film, brought back so many memories. I lived in Uxbridge as a child, learnt to walk in Fassnidge Park. Worked at King and Hutchings where I met my husband, and then moved back to live there in 1967 when I got married. I remember being in Burtons at a dance when we received the news of President Kennedys assassination. I lived twice at raf uxbridge and was amazed at the history of the unit. I was living on the camp when the IRA bomb exploded in a barrack block. I also remember that repairs to that barrack block were carried out because it was a listed construction. Does either that barrack block or the wo's and sgt's mess still stand or do armed service listed buildings importance fluctuate when commercial interests means lots of money to whom makes these decisions. I am attempting to find out what happened to raf uxbridge's wos and sgts mess that was the oldest mess in the RAF and surely a listed building?